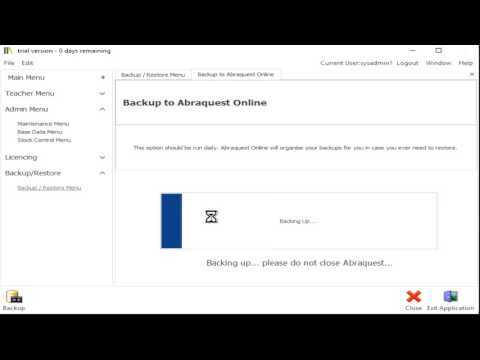 Abraquest Automated Backup keeps all your Abraquest data safe and is quick and easy to use. Over recent years we have connected Abraquest to the Microsoft Azure cloud system offering good value, reliable and most important private storage services which are available to all customers as optional extras (currently via Abraquest Software Assurance and Abraquest Automated Backup). Following the introduction of Abraquest Online a couple of years ago, which provides a book database of over 2.5 million books to ease initial data entry, we have introduced Abraquest Automated Backup. This provides an easy to use backup feature that saves you having to worry about where to backup to, and keeping the USB drive safe and off site as you would do without it. The consequences of not backing up at all are severe - you would have to do the initial entry of all your books again at worst, if you didn't have a single backup, or at least work out which classes and school years your pupils were in and the possible loss of pupil reading histories. The system automatically manages backup space, keeping all backups from the past two weeks, and then selectivily removing older backups, while ensuring you keep some copies of backups taken a while ago. When backups are over 5 years old, it currently keeps one per year for up to year 10. You can view any of these in the List Backups option and restore using the Restore from Backup option. All you need is an internet connection and an Abraquest Automated Backup subscription! Finally, when Abraquest exits, it asks you if you would like to backup. If you don't have Abraquest Automated Backup, you will have to backup to a USB stick or network drive like before, but at least the question hopefully will remind you! This first video shows you how to set up the Abraquet Cloud using the username and password provided that is unique to each customer. Backing up to the Cloud is Easy Peasy! 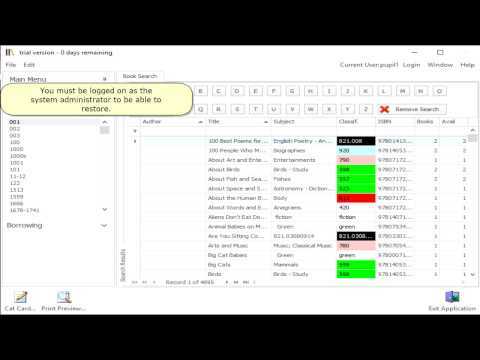 The second video shows how easy it is to make an off-site backup to the cloud. When restoring you have the option of overwriting the current database, or restoring to another location so you have more options. Restore normally takes place when speaking with technical support in any case, so no need to worry if you aren't sure which option you would choose - it depends on why you are restoring in the first place.